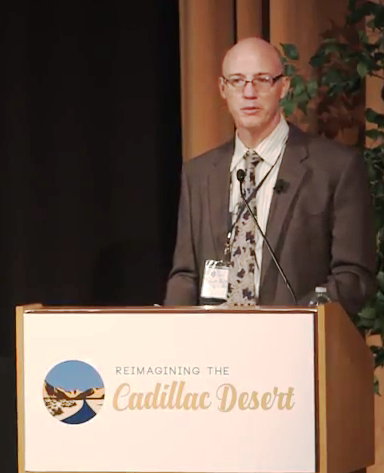 REIMAGINING THE CADILLAC DESERT, Part 3: How are cities looking at water? 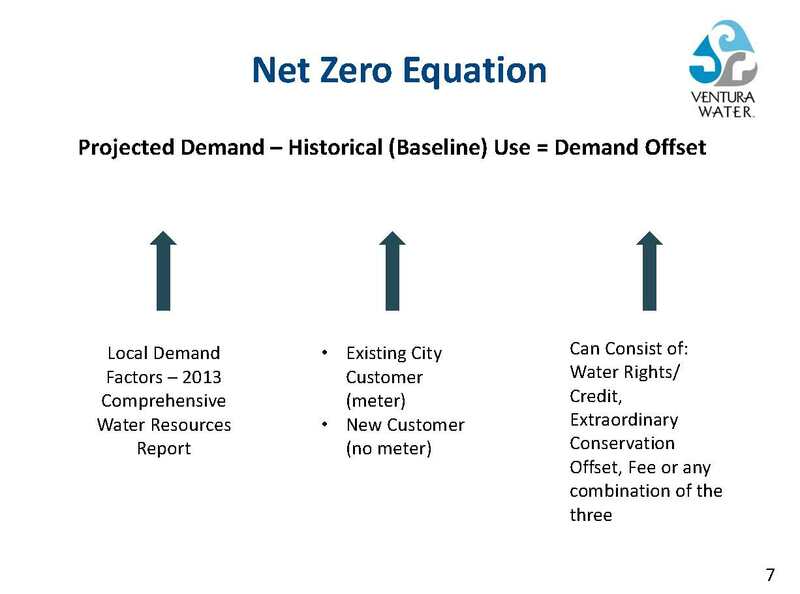 Cities are finding it increasingly difficult to provide clean and affordable water service in the face of water shortages and rapidly changing regulatory, physical, and fiscal constraints. 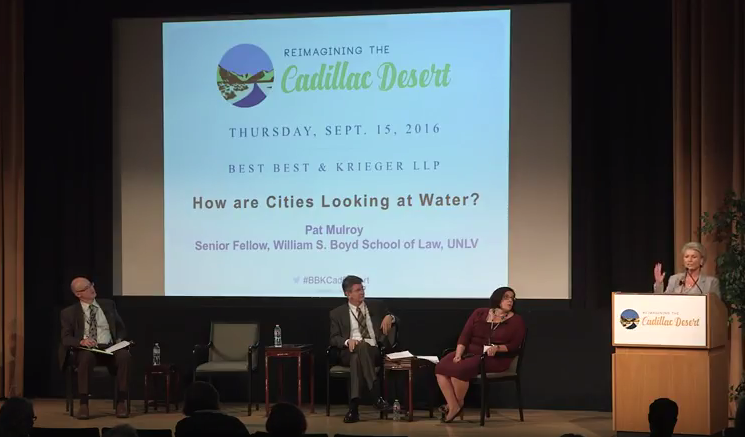 In the last part of coverage of BB&K’s Reimaging the Cadillac Desert, Pat Mulroy, Senior Fellow with the William S. Boyd School of Law at UNLV and former General Manager of the Southern Nevada Water Authority; David Pettijohn, Director of Water Resources, Los Angeles Department of Water and Power; and Shana Epstein, General Manager for Ventura Water discuss water supply reliability for their regions in a panel discussion moderated by Scott Burton, Utilities General Manager for the City of Ontario. After introductory comments were concluded, each panelist gave a brief presentation. Shana Epstein focused her presentation on the water development policy that was passed this summer. 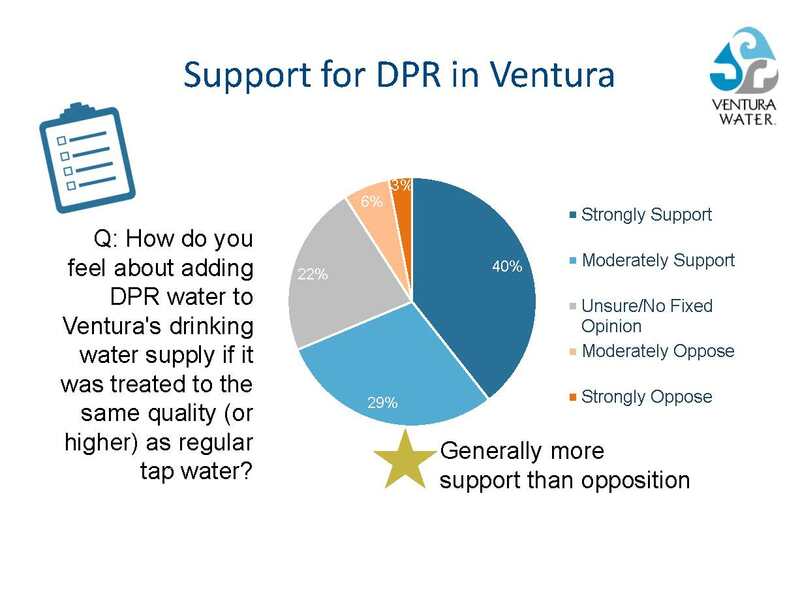 She began with some basic information on Ventura’s water resource situation. 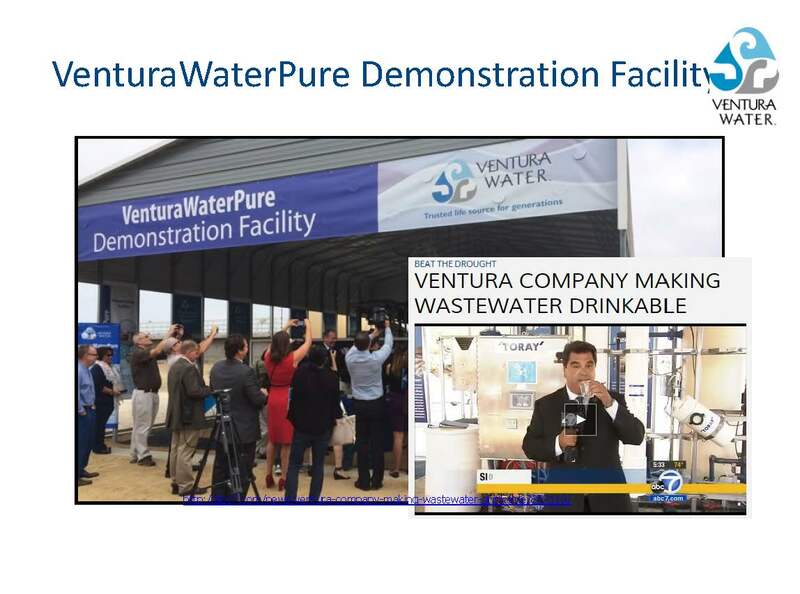 In July of 2015, Ventura Water launched a potable reuse demonstration pilot project which ran for 6 months. “It was only a 20 gallon per minute system, but it was a really important test,” she said. 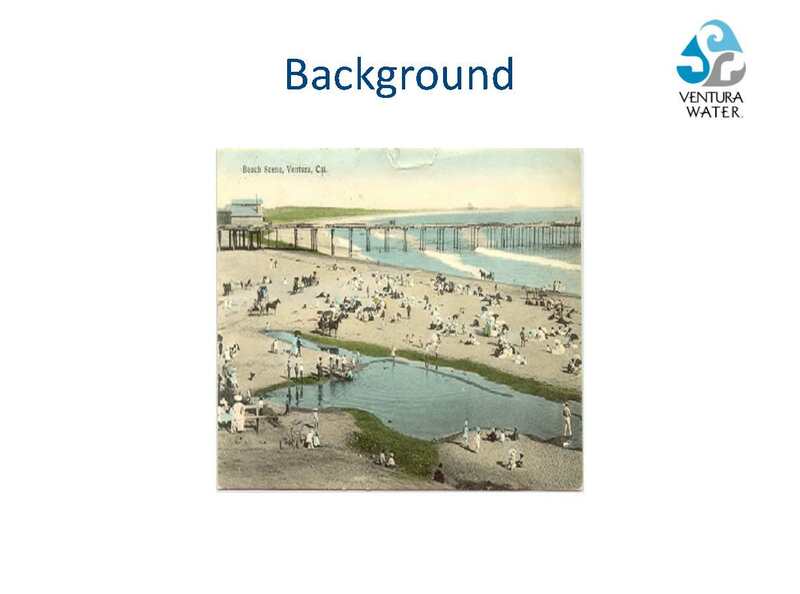 This was their second study, and was focused on how to blend it with their other water resources, she said. They also worked with students from UC Santa Barbara on the communications studies with our public to determine how much they would accept this project; they called people as attended public events to interview about 200 people. The demonstration project tested four different technologies: pasteurization, which was applied before the water went through the membranes; then micro-filtration, reverse osmosis, and ultra violet. 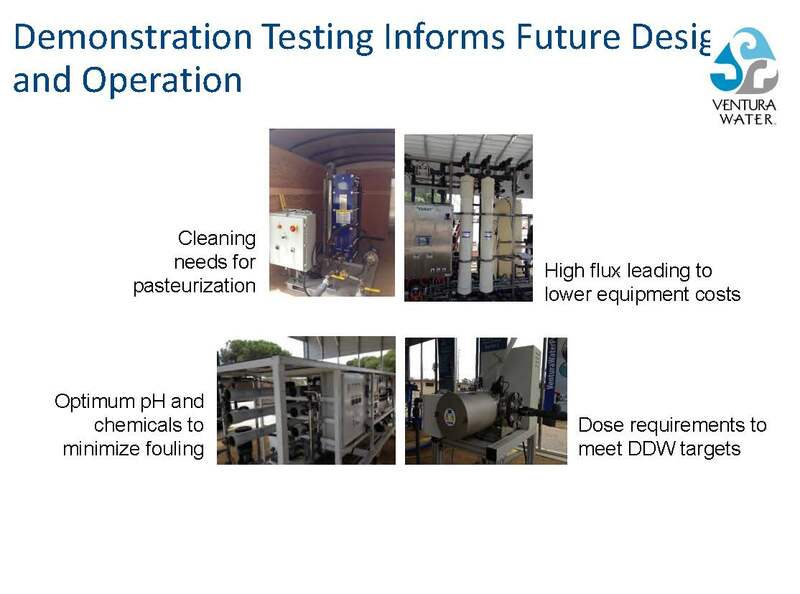 They learned about cleaning needs for pasteurization, high flux leading to lower costs, optimum pH and chemicals to minimize fouling, and dose requirements to meet DDW targets. “We learned different things by using our actual water resource, so it’s really important for us to actually use our water resource that we were going to use, and see how it worked with all of these things,” she said. 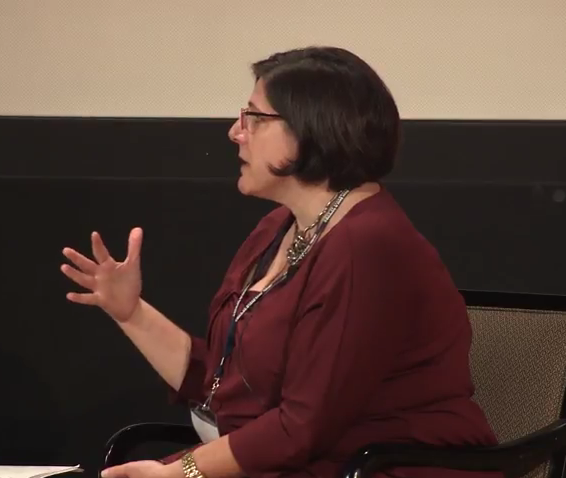 “This really takes leadership and there are going to be threats and it’s a change of how we move forward, but this is a way for us to make sure there’s water long into the future,” she concluded. Los Angeles gets the water from ‘three straws and a bathtub’, as Mr. Pettijohn described it: a straw out to the Colorado River, a straw out to the San Joaquin and Sacramento Rivers, and a straw out to the Owens Valley. 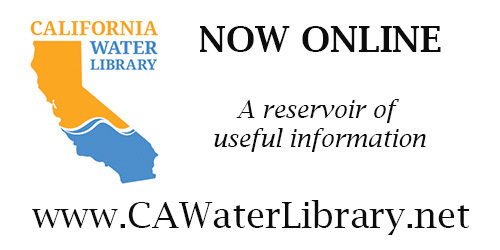 Supplies from the LA Aqueduct have been cut in half over the last 30 years or so as about half of the LA aqueduct has been re-purposed for environmental restoration in the Owens Valley and dust mitigation on Owens Dry Lake. The Colorado River system has come under a lot of pressure, in 2018 there’s about a 50 percent chance of the first time in history being a shortage on the Colorado, and for the three following years after 2018, there’s about a 60 percent chance of shortage on the Colorado. “What I tell people is it’s not if we’re going to go into shortage on the Colorado; it’s only a matter of when,” he said. 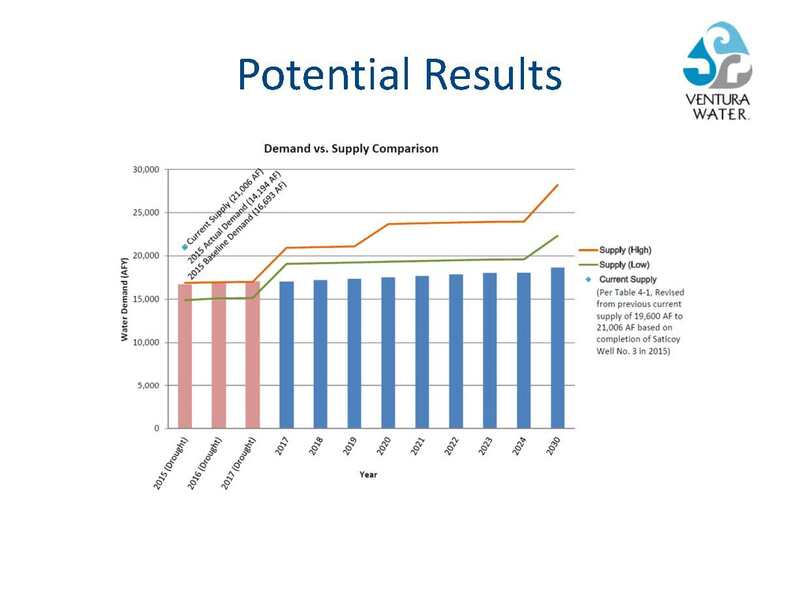 The State Water Project has ecosystem problems in the Delta with salmon and smelt that have reduced exports from the Delta. 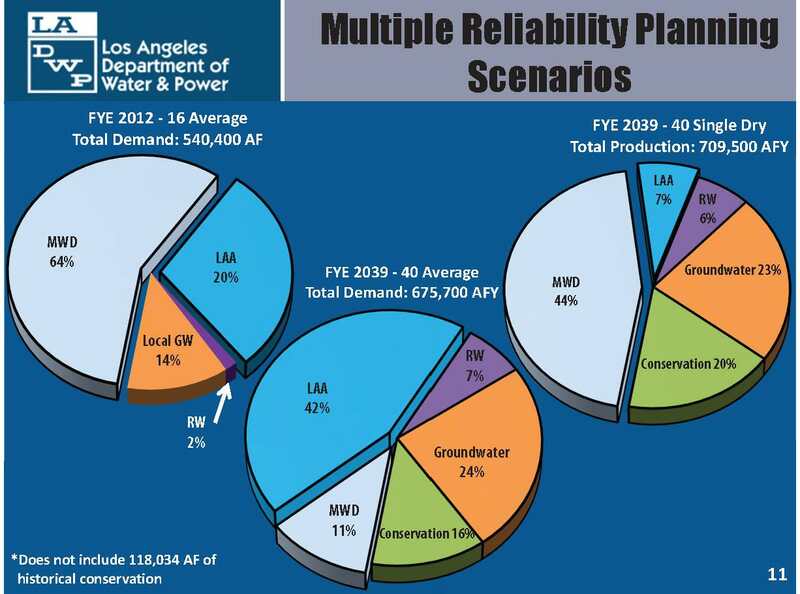 The San Fernando Valley groundwater basin has long been contaminated, and they are trying to come up with a solution to deal with that contamination. 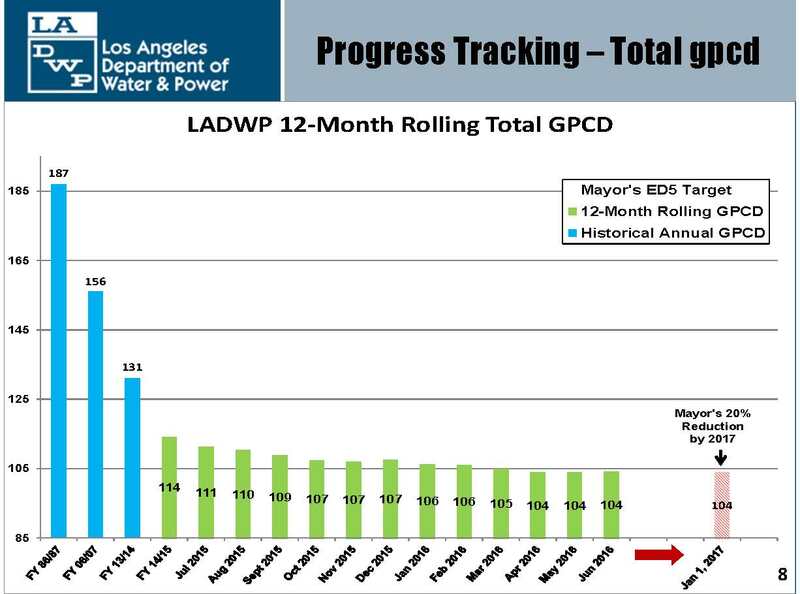 “There are challenges everywhere you look for water now,” he said, presenting a graph showing Los Angeles’ water resources from 1981 to present year. 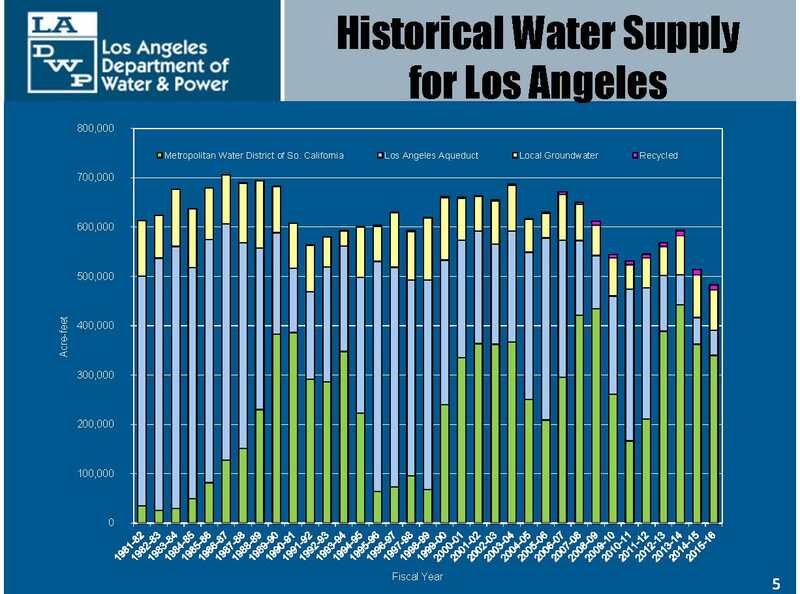 He pointed out that in 1980, most of LA’s water came from the LA Aqueduct as represented in blue; the water from Metropolitan, shown in green, continued to grow over time. 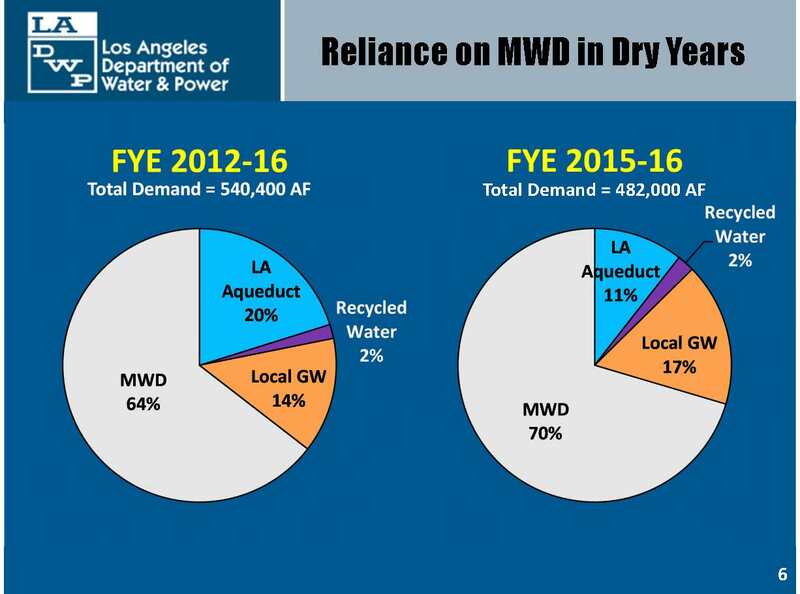 “You can see that now the vast majority of our water, especially in dry years, comes from the Metropolitan Water District,” he said. 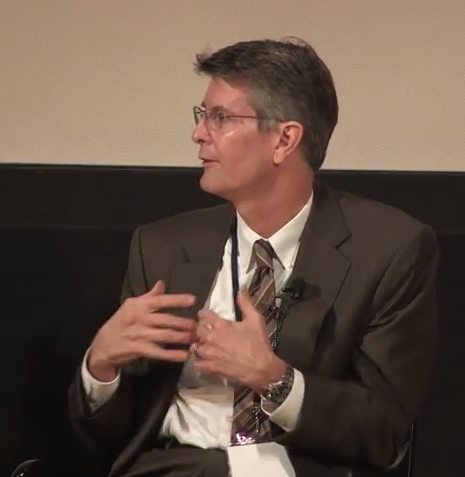 Mr. Pettijohn said they were able to meet the governor’s statewide directive to reduce 25%; they were also to pass the state stress test scenario, so they are not currently under any state mandated reductions, but they are still trying to reach the reductions that the mayor has required. 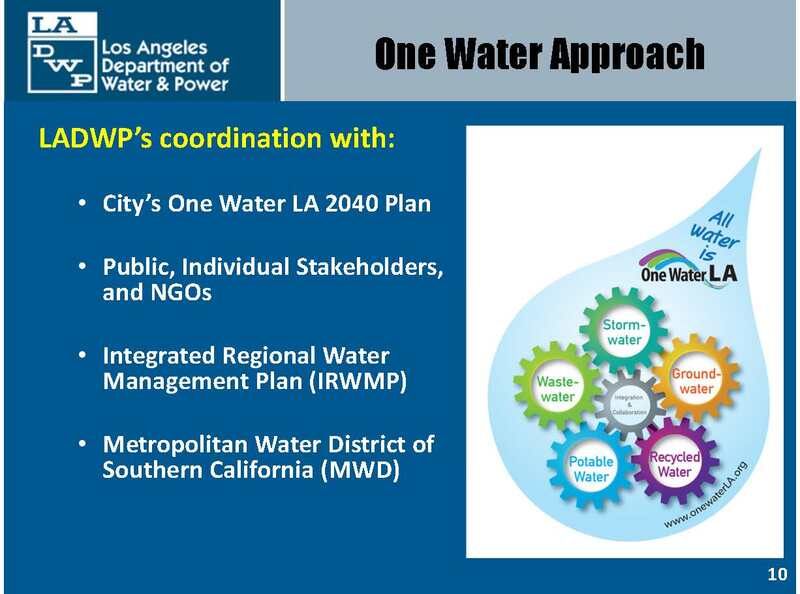 LA DWP has ‘One Water’ approach that breaks down the silos and reaches out to the different city departments, the public, the individual stakeholders, universities and NGOs to incorporate them into the planning processes. 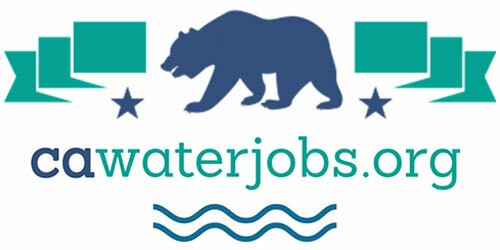 They have MOUs with Tree People and the Council for Watershed Health. 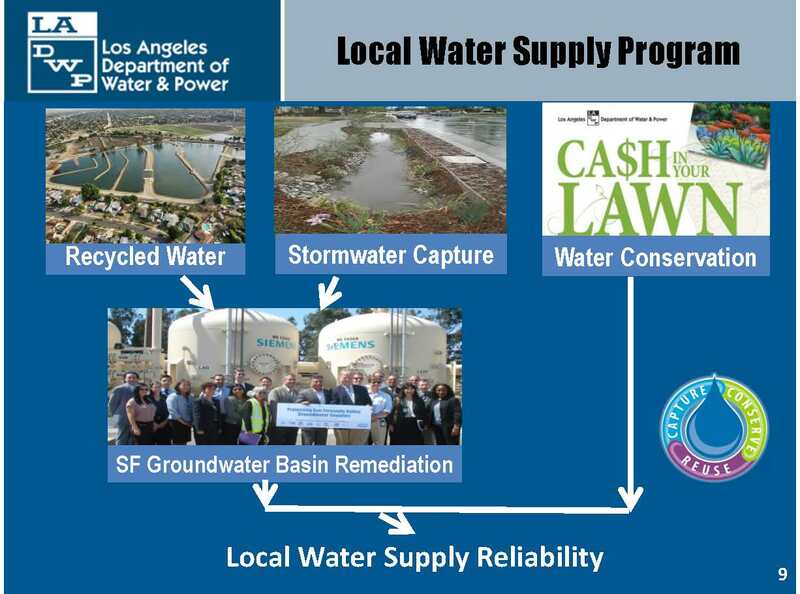 “We work with the Integrated Regional Water Management Process, a county wide process that draws everybody who’s got a stake in the watersheds into a dialogue about how statewide money is going to be spent in those watersheds, and then of course, the Metropolitan Water District’s long standing collaborative process,” he said. The net result of the conservation was that Las Vegas added 500,000 people and cut water use by 40% and in a very short period of time; they invested heavily in leak reduction and prevention, and their leakage rate hovers around 5% and is one of the most leak-proof systems in the U.S., she said. Moderator Scott Burton began the discussion period by asking Ms. Epstein and Mr. Pettijohn how they implemented the Governor’s conservation mandate. Mr. Pettijohn said that they also put a lot of prohibited uses in place, such as not letting water runoff your property, not watering when it’s raining, or not watering between 9am and 4pm. “Things that just make common sense. If you violate, we’ll warn you, give you a chance to comply. If you refuse to comply, then you start getting fined.” They changed their two-tier water rate structure to a four-tier structure, he said. Scott Burton then turned to Pat Mulroy and asked her if she were advising the governor of the state of California, would she have implemented the drought reductions in that fashion? 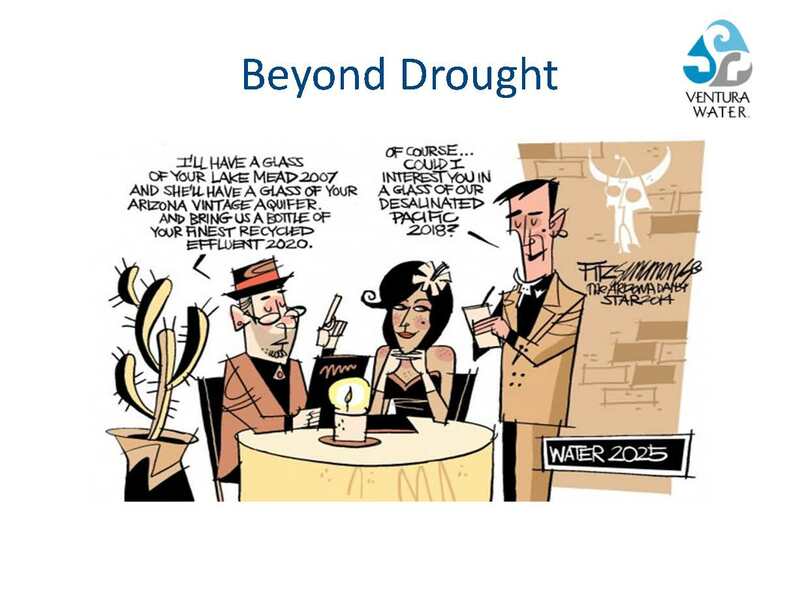 Moderator Scott Burton then turned to the issue of technology, and asked for the panel’s thoughts on how some of the newer technologies that can help with water supply. The other thing DWP has done is recently funded the 3.2 acre La Kretz Innovation Center in the arts district in downtown LA. 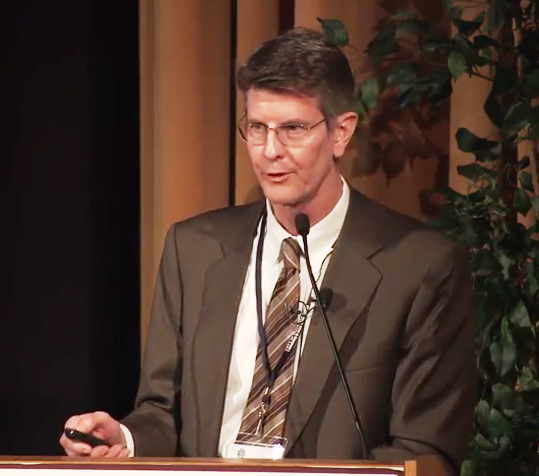 “It focuses on clean tech industry ideas and brings together people who are interested in thinking about green infrastructure and how to come up with new business models to push out green infrastructure ideas into the community, so we’re trying to think of new ways as well as old ways to achieve some of these goals,” said Mr. Pettijohn. Ms. Mulroy said they’ve invested heavily in technology and have partnerships with universities and other organizations where they are doing joint technology development; they put out RFPs to the world, and receive proposals from entrepreneurs who may want their new technology tested, or young companies that have been struggling to get into the US market. They have brought several of these companies to Southern Nevada. 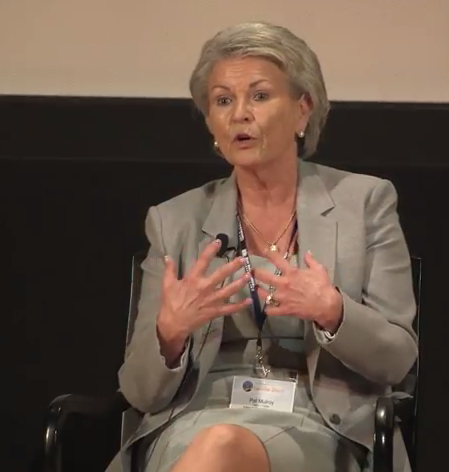 An audience member asked Pat Mulroy if they raised water rates and are they tiered? An audience member asked Ms. Mulroy how she would recommend the same regional partnerships such as she described happening for the southwestern region be established between northern and southern California? 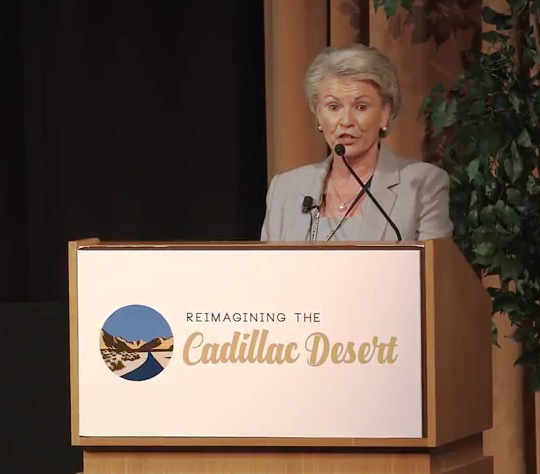 For more coverage from the Reimagining the Cadillac Desert event, click here. 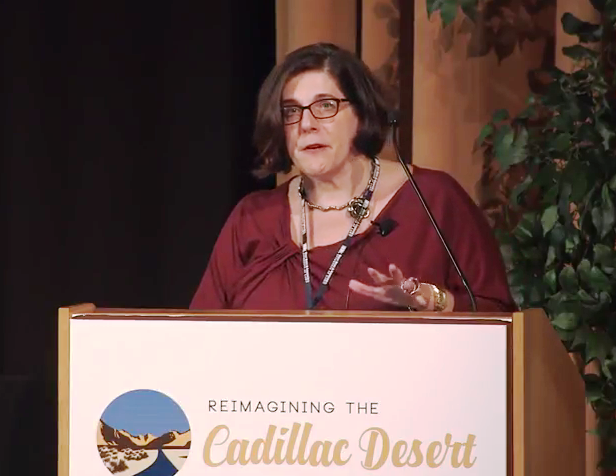 Click here to view presentations and videos from the Reimagining the Cadillac Desert conference from BB&K. Too worlds will collide and stupid will meet stupider at the intersection of their collision ! 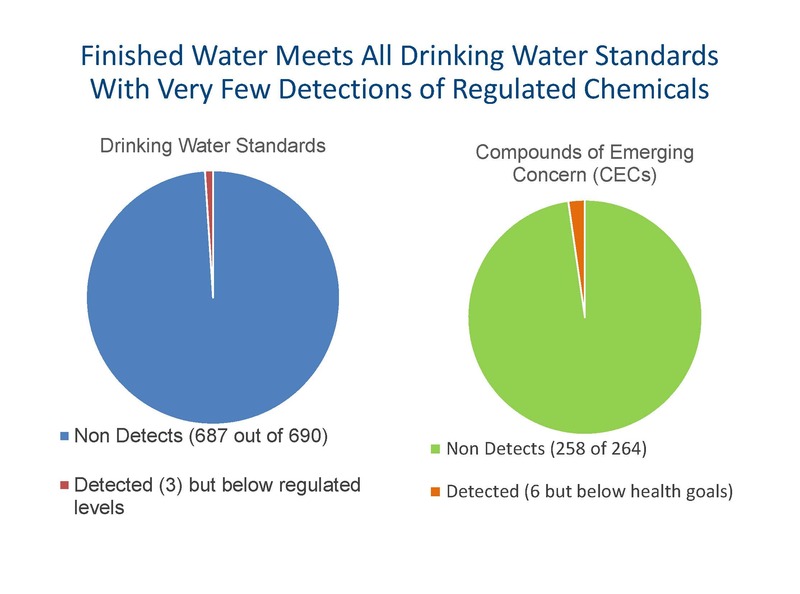 How will a mitigated solution remove nitrogen form polluted groundwater ? 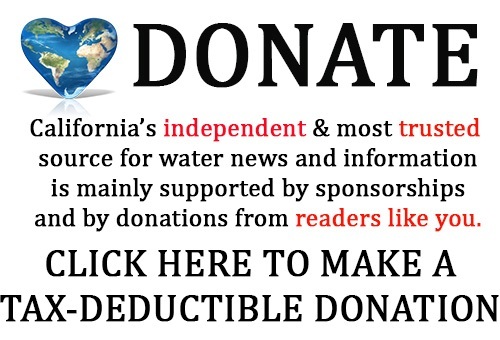 taking more money away from farmers to purchase bottled drinking water for the disadvantaged homeowners of poverty stricken rural areas in the central valley is like using bubblegum to plug a hole in a gas line ! all you get with a fix like that is poorer farmers and unclean water. Wanton disregard is a very serious accusation that indicates that a person behaved extremely recklessly. 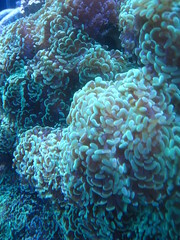 Wanton disregard is not malicious, but it is more serious than carelessness. Wanton disregard can be used as evidence of gross negligence. Big Oil was allowed to manufacture synthetic nitrogen products ! Chemical Companies made trillions in profit’s from selling these products to farmers. The way they sold them was to “exploit professionalism”. Professional’s highly respected in their respective industry were viewed as the “go to guys/girls” when it came to following the mandates for employing good agricultural practices as outlined in the “Western Fertilizer Handbook” also known as the “The Bible” in the cultural practices mandate that was developed and published by a cascading group of U.C. Regents, Scientist’s, soil scientist’s, agronomist, manufactures, i.e. industry emeritus professionals that spoke to farmers as if their publications and recommendations were sent from God himself. Not only professionals ! but the PCA’s professional Ag consultants that represented broker/dealers or direct manufactures, or worked in in an independent capacity handed out “just like doctors hand out medication prescriptions” written recommendations with warranted legalese language ! telling farmers to use the products to farm best with. The error’s and omissions, and stick product liability policies that all these secession profiteers used to cover themselves while doing business throughout the world need to be examined. I think “case law” in some cases will paint the picture for relief farmers can seek as victims of fallout from the use of chemicals, and “in this instance” Nitrogen based upon their reliance upon the value of the industry professionals that prescribed these “cocktails of poison” that farmers unknowingly used as a good “steward of the business model” they were focused with, in order to produce quality and abundant sources of safe food and fiber for the world. The case law might leak out through the volumes of stipulated “drift spray cases” and/or “adjudicated cases” all ready on the books and in sealed stipulated settlements with similar cases. The same holds true for the government watchdog agencies tasked with the responsibility of denying or allowing a known synthetic substance that could cause irreparable harm to humans and animals to be produced in such abundant amounts [i.e. Players like Simplot’s Valley Nitrogen Plant located south west of Fresno California. Could there be a correlation to groundwater contamination in groundwater through leaching from this single manufacturing plant alone ?] One would think so ? . These agencies approve the use of the science, the manufacture’s, and the methodology. How can that government now turn on one prick point player in this catastrophic unpredictable outcome of events and force them to be the sole responsible party required to pay for the wrongs of the so many others in the chain of title ? This battle needs to be framed in the right perspective ! and we need push back now before they spin the narrative. This is an epic 911 condition that’s needs a “call to action plan” put into place immediately ; if not yesterday. Keith Freitas, on the referendum of justice for all !